It’s common for people to think that cognitive training is, well, just cognitive training. This is actually far from the truth. The brain is the most complex system in the known universe, and accordingly, there are myriads of ways to train it. The surprise is that cognitive training products on the market today can take wildly different approaches to training up the mental muscle between your ears. To give an idea of this, we will compare NeuroTracker to brain trainers, to show just how different such interventions can be. But first, let’s get some perspective on what brain trainers are. Over the last decade brain training companies like Lumosity, CogMed, Posit Science, NeuroNation and many more, have seen a huge surge in popularity. Over the last few years in particular, they have attracted a lot of attention in the media through an on-going debate over efficacy. The big question is whether or not they actually help their users flex their mental skills in real life – what’s known as far transfer. This has included a lot of scientific criticism. In a nutshell, the argument is that brain trainers in general help people get better the specific tasks they train on, but that this does not transfer into real-world abilities, or to better mental health. This case was infamously demonstrated with the $2m FTC lawsuit against Lumosity for deceptive advertising. The argument less well heard in the public mind is that, although there are many brain trainer products without evidence of scientific efficacy, there are a number of leaders in the market who do demonstrate training benefits. For example, studies by Posit Science and CogniFit have been reviewed to uphold the gold standard of scientific research and found some improvements in real-world skills such as driving safety. This is essentially a quality versus quantity perspective. If there are actually some brain training products that can genuinely improve people’s mental abilities, then qualifying which types of training are effective could be important for seeking benefits today. However, even this idea of qualifying brain trainers from one another is too narrow. This is because brain trainers don’t represent the much broader domain of cognitive training – a key point which has been pretty much missed throughout the whole debate in the media. This is an important notion because the future of cognitive training is evolving out of a growing tidal wave of neuroscience research, meaning tomorrow’s cognitive interventions could hold the potential for benefitting humankind. To get a clearer idea of why brain trainers are just one approach to cognitive training, let’s take a look at some of the typical characteristics of brain trainers. Though it’s difficult to pin down exactly, and there are exceptions, brain trainers tend to have these similar characteristics. Long interventions – studies generally show that to achieve benefits, training typically requires 30-50 hours of distributed training, or longer. Across these interventions timescales, near transfer effects, such as gains on standardized neuropsychological tests, tend to be modest or negligible. Near and narrow transfer – with a few notable exceptions, brain trainer studies to date tend to only support transfer to tasks that are structurally very similar to the actual training tasks. For example, transfer is often related to working memory tests that are not actually that different to the brain training tasks themselves. This leaves a gap in research looking at evidence of far transfer to real-world abilities. Focused populations – brain trainer products and marketing are dominantly aimed at the active aging market. For this reason, there is little known about their scientific efficacy for other populations and accordingly, they are not a realistic option for most people. High task complexity – using a ‘potpourri’ approach, brain trainer products usually comprise a range of exercises in the form of short games. This can be as many as 50 or more different games, each with their own rules to figure out. This means there is a lot to learn before actual training can be performed properly. Ambiguous results – brain trainer games tend to have different ways and strategies to perform them, which factor into how well you do at them. This brings in the issue of practice effects – the notion of picking up different techniques do better. For this reason, it’s difficult to distinguish if an improvement in score means a person’s actual cognitive abilities has improved, or whether they have simply worked out a more efficient way of performing the task. This factor combined with so many different games means there’s generally no actual scientific measures that can be drawn from the scores obtained. These characteristics highlight some limitations of brain trainers, however, there are also many advantages, such as motivation from having a variety of exercises, as well as ease of access that comes with being able to train through a web browser. That said, when considering the whole space of cognitive training, it does reveal that brain trainers have certain characteristics that can differ significantly from other forms of intervention. Here we’ll compare NeuroTracker to provide an example of how distinct these differences can be. These are some of the key factors that define why NeuroTracker is a genuinely unique form of cognitive intervention. Short interventions – using just 6-minute sessions, many studies have shown that NeuroTracker produces clear evidence of benefits with just 1-3 hours of distributed training. The effects have also been shown to be robust, with significant improvement effects on high-level cognitive functions. Wide and far transfer – gains in executive function, working memory, processing speed, several forms of attention, and other cognitive abilities have been corroborated by multiple peer reviewed studies. Far transfer to real-world abilities has also been demonstrated, notably this includes improving passing decision-making accuracy in competitive soccer play. Broad populations – from children to the elderly, amateur athletes to professional athletes, students with learning disabilities to university students, numerous studies to date show that NeuroTracker benefits are valid across diverse groups of people. This also includes relevance in a number of medical conditions, such as concussion rehabilitation. Low task complexity – with just a few simple instructions, an average person can start NeuroTracker training and know exactly what they need to do. This has been shown in studies with young children with conditions such as Autism, ADHD and Intellectual Deficit, who intuitively pick up the task from the get-go. With training over time, the cognitive load of the exercise can be evolved through NeuroTracker’s difficulty settings, or by adding on dual-tasks, but the Core task remains simple. Scientific results – NeuroTracker presents scores as an objective ‘speed threshold’ measure, deemed to have negligible influences from practice or technique related effects. For this reason, it is a tool not only used by researchers to assess an individual’s cognitive state, but also as a metric to assess the effects of other factors on cognitive status. For instance, one study used NeuroTracker to investigate whether exercise improves cognitive function, and another used its measures to assess concussion recovery. 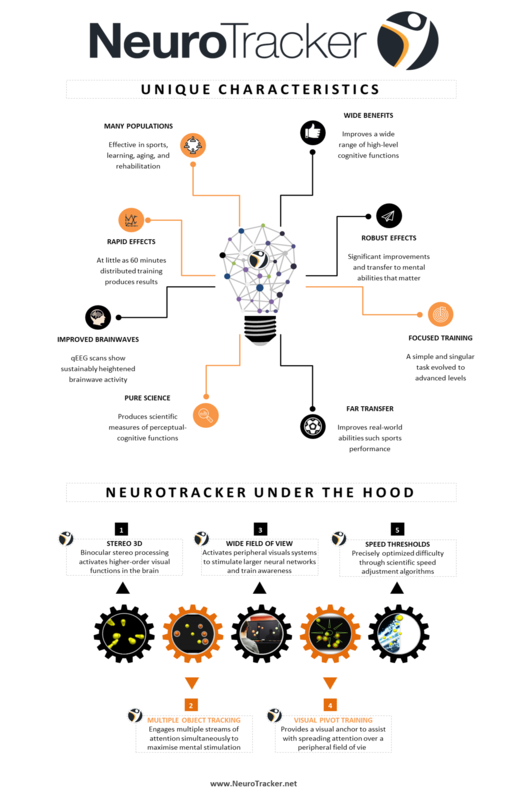 This infographic highlights some of the characteristics that make NeuroTracker unique. As we’ve seen, cognitive training methods can vary greatly, not just in terms of what they do, but more importantly, in the effects they can transfer. In addition, companies which engage in peer-reviewed frontier research should be recognized for the benefits they can bring to people wanting to enhance their mental abilities – which let’s face it, is virtually everyone on the planet. A prime example of fulfilling this need is the Digital Therapeutics Alliance, a global non-profit association with the mission of broadening the integration of clinically-validated digital therapeutics into healthcare through education, advocacy, and research. They only accepted evidence-based companies as their members. NeuroTracker has recently been accepted into the alliance, with the goal of researching practical cognitive applications for specific industries. Another non-profit organization called the ‘Faubert Applied Research Centre’, also works with research partners around the world to develop and validate custom applications of NeuroTracker at a scientific level. Initiatives such as these are dedicated to bringing the potential of cognitive training into the hands of people that can benefit from them. Jean Castonguay, the Co-Founder of NeuroTracker with Professor Jocelyn Faubert, summed up the importance of differentiating cognitive products currently available in the market. If you’d like to learn more on this topic, check out Jean Castonguay’s Expert’s Corner blog. Are all Cognitive Training Programs Created Equal? As CEO for NeuroTracker Jonathan has both technological and marketing expertise and thrives on developing disruptive and cutting edge projects. He has founded and helped build several multi-million dollar companies in the Fintech and Health industries. Jonathan is an accomplished speaker who has spent a lot of his career travelling the world to personally coach and keynote CEOs, CTOs, government leaders and college/university professors on emerging technologies and scaling their businesses. Jonathan is happily married and a proud Father of three beautiful children.